Typeface designer and font developer Mark Simonson watched the beloved TV series "Mad Men" (2007–2015) with a critical eye and found that, although visually pleasing, the typefaces used in the show together with additional props belong to a different era. Simonson's piece "Mad Men, Mad Props" is from 2008, but includes the names of several beautiful typefaces, which I found interesting and valuable for my future graphic design work. Then there is the Gill Sans (c. 1930) problem. Gill is used quite a lot in the series, mainly for Sterling Cooper Advertising's logo and signage. Technically, this is not anachronistic. And the way the type is used—metal dimensional letters, generously spaced—looks right. The problem is that Gill was a British typeface not widely available or popular in the U.S. until the 1970s. It's a decade ahead of its time in American type fashions. 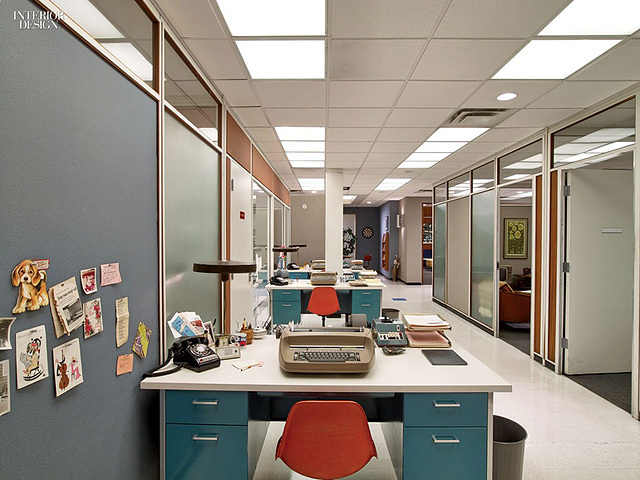 Featured image: Reproduced secretary desks photographed by Eric Laignel for Interior Design's article "Welcome to 1969: Mad Men's Award-Winning Set Design". H/t web magazine Charles & Hudson.